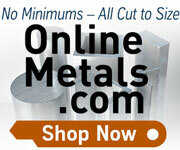 LittleMachineShop.com has the measuring tools you need for your shop. We carry calipers, micrometers, steel rules, wigglers, edge finders, center gages, screw pitch gages, and more. The angle gage set is furnished in a vinyl case for storage. This small device is great for setup or checking angles. It is accurate and reliable and the magnetic base makes for easy angle checking on a work piece, angle vise or sine vise, and whatever else you can dream up. This dial bore gage is easy to calibrate with a ring gage or micrometer. Center gage made in the US by Products Engineering Corporation (PEC). Used for grinding and setting screw cutting tools. Scales with 14ths and 20ths graduations provided on one side, 24ths and 32nds on reverse side. Scales are used to determine number of threads per inch. Gage also features a table of double depths of thread for selecting size of tap drills. Made of hardened spring tempered steel, with a protective satin chrome finish. All gaging surfaces are precision ground. These gages meet the following standards: American National or U.S. 60°, Whitworth or English 55°, and Metric 60°. They also have a very useful scale for finding the number of threads per inch through graduations in 14ths, 20ths, 24ths and 32nds of an inch. The gage also has a table of double depths of threads for determining size of tap drills. Used for grinding and setting tools when cutting Acme threads whose sides have an inclination of 14-1/2° (29° included angle). Angles and edges are precision ground. Satin chrome finish provides protection against corrosion. 6" x 6" granite base flat within 0.0005"
This granite dial gage comparator stand will accept any AGD 1, 2, 3, or 4 dial indicator. These very handy depth gages can be used to quickly obtain measurements in 32ndof an inch by simply adjusting the rule to the required depth. The gage consists of a nicely finished, hardened steel head and an accurate, machine divided, tempered steel rule. Letter size drills can be quickly and conveniently checked with this gage. Twenty-six holes are provided, giving corresponding drill sizes from "A" through "Z" with decimal equivalents from .234" diameter through .413" diameter. The gage is approximately 5/64" thick by 2 5/16" wide and 6 1/4" long, is hardened and has a satin finish. Thoroughly tested after hardening. Using this gage, the size of any twist drill from 1/16-1/2" by 64ths can be quickly determined. The gage has a total of 29 holes, each marked with the drill size in inches and the decimal equivalent. Gage is rigidly tested after hardening and has a black matte finish. Gage information is steel stamped on one side and white marked on the reverse side for quick, clear reading. Approximately 5/64" thick by 2 5/16" by 6 1/4" long. Starrett double end edge and center finder. Starrett catalog number 827MB. The body is 10 mm diameter. One end has a 6 mm diameter contact. The other end has a pointed contact. Work surfaces may be located easily, quickly and accurately with these edge finders. Work with flat, straight edges, shoulders, grooves, round work, studs, dowels, or center points and scribed lines - all can be accurately located with this handy tool. Body and contacts are made of tool steel, hardened, ground and lapped to close tolerances for diameter and concentricity. iGaging's MiniMag 6" Height Gauge makes vertical and horizontal measuring easy. The large LCD display gives measurements in inches, millimeters and fractions and unit has ABS and hold functions. Mounted on a solid aluminum base with magnets, the gage has a stainless steel beam for smooth travel with no play. IP54 rated for splash water, oil & dust resistance, the resolution is 0.0005" (0.01mm) with an accuracy of +/-0.001" (+/-0.03mm). Controls are Zero reset, On/Off, inch/mm/fraction conversion, Hold, Absolute. Rounded nose scriber cuts clean, sharp lines Easy-to-read LCD with .32" high characters This digital height gage features Inch-millimeter conversion and zero at any position. It has a manual ON/OFF button but will also turn off automatically after 5 minutes of inactivity. The stainless steel bar is hardened for long life. The scriber can reference zero from the base bottom. It also has a slide lock and fine adjustment thumb roll, plus it features a hardened, ground, and lapped base. This is a stainless steel dial height gauge with 0.001" graduations. Great for aligning a vise or setting up a work piece. Easily center work in a 4-jaw chuck by using this indicator holder in your tool post or standard turning tool holder holder for a quick change tool post with almost any indicator. This magnetic base works great with test indicators. It has a fine adjustment which works well for small adjustments without manually moving the indicator or work piece. The base is 3-1/2" x 1-3/16" x 1"
This magnetic indicator holder locks all its joints when the knob is tightened. The on/off switch makes it easy to position. The V-groove base allows you to mount it on cylindrical surfaces. The permanent magnet has an 80 kg (176 lb) holding force. The lower arm is 110 mm long, the upper arm is 100 mm long. This magnetic base indicator holder has a fine adjustment feature. The on/off switch makes it easy to position. The V-groove base allows you to mount it on cylindrical surfaces. The permanent magnet has an 60 kg (130 lb) holding force. Magnetic base indicator holder with fine adjustment mechanism on the top of the base. Magnet has 176 lbs of pull. Base is 60 x 50 x 55mm. Magnetic base indicator holder with fine adjustment mechanism on the top of the base. Magnet has 66 lbs of pull. Base is 36 x 30 x 35mm. Base is 1.2" by 1.5". Maximum reach 7". This magnetic base holder is the perfect size for mini lathes and mini mills. It accepts dial indicators with 3/8" stems and dial test indicators with dovetails. This magnetic base indicator holder has a fine adjustment feature. The on/off switch makes it easy to position. The V-groove base allows you to mount it on cylindrical surfaces. The permanent magnet has an 66 kg (145 lb) holding force. For use with all Starrett Test, Back-Plunger, AGD, Dial and Miniature-Dial Indicators. Also accommodates similar indicators of other manufacturers. This 0-3" micrometer set features carbide faces and clear 0.0001" graduations on a satin-chrome finish. The frames are forged steel. 1" and 2" standards are included, as well as adjusting wrenches. The micrometers have a ratchet stop for exact repetitive readings and a lock lever to lock the barrel. The micrometers come in a fitted case. Measuring range 0 to 3"
Three micrometer set manufactured in the style of Mitutoyo micrometers have a measuring range of 0-1", 1-2", and 2-3". The Vernier scale has 0.0001" graduations and an accuracy of +/- 0.0001" per inch. Hardened and ground measuring faces are wear resistance and the hardened, ground, and lapped spindle thread provides smooth movement and accuracy. Micrometer have friction thimbles with ratchet stops. Baked enamel frame, thimble and sleeve have a satin chrome finish. Set includes three micrometers range of 0-1", 1-2", and 2-3", 1" standard, 2" standard and a fitted case. Starrett catalog number ST436.1AXRLZ (was ST436AXRLZ). This 0-6" micrometer set features carbide faces and clear 0.0001" graduations on a satin-chrome finish. The frames are forged steel. 1" through 5" standards are included, as well as adjusting wrenches. The micrometers have a ratchet stop for exact repetitive readings and a lock lever to lock the barrel. The micrometers come in a fitted case. This 0-75 mm metric micrometer set features carbide faces and clear 0.001 mm graduations on a satin-chrome finish. The frames are forged steel. 25 mm and 50 mm standards are included, as well as adjusting wrenches. The micrometers have a ratchet stop for exact repetitive readings and a lock lever to lock the barrel. The micrometers come in a fitted case. This 0-1" micrometer features carbide faces and clear 0.0001" graduations on a satin-chrome finish. The frame is forged steel. An adjusting wrench is included. The micrometer has a ratchet stop for exact repetitive readings and a lock lever to lock the barrel. The micrometer comes in a fitted case. Will measure to 5/16" (8mm) depths. This digital electronic micrometer with carbide measuring faces has a resolution of 0.00005". There are three buttons; ON/OFF, SET to zero the display, and ABS/INC to switch between absolute and incremental measurement. The micrometer turns itself off after about 5 minutes of inactivity. Pressing ABS/INC zeros the micrometer at any position so you can make comparative readings between two parts. The absolute measurement is not lost, and is displayed by pressing ABS/INC again. The IP54 code says that dust shall not penetrate in a quantity to interfere with satisfactory operation of the device or to impair safety, and water splashed against the device from any direction shall have no harmful effects. Easy to read digital electronic micrometer with a large LCD digital display + Vernier scale reading in the spindle. The digital display has two measuring modes Metric/Standard as well with absolute and incremental modes for each. The spindle has carbide measuring faces and the resolution of 0.00005"/0.001mm. Measurement range is 0-1" and the unit is rated as IP65 (water, oil and dust resistance). There are three buttons; ON/OFF Zero, ABS in/mm to switch between imperial and metric with absolute and incremental measurement options for each. The micrometer has an auto shut-off. Comes with an adjustment wrench and a 3V CR 2032 lithium battery and a ball adapter. The Starrett 0-1" micrometer is the jewel of precision tools used by skilled workmen worldwide. The spindle and anvil are sized at .235" (6mm) to reach places most micrometers cannot reach. The balanced frame and thimble design insure easy handling and better readability. A ring-type knurled lock nut provides quick and sure locking. The combination ratchet and speeder provides uniform pressure and quicker adjustment. A gracefully designed tapered frame allows use in narrow slots and tight places. The Starrett T230XRL micrometer has a rigid one-piece frame of drop forged steel and an extremely hard and stable one-piece spindle (the heart of the accuracy). It features micro-lapped measuring faces, quick and easy adjustment, plus Starrett workmanship. This set of thread measuring wires includes 48 wires of 16 different diameters for the three wire thread measuring procedure. You can measure threads from 3 to 48 threads per inch, and metric threads from 0.5 mm to 6 mm pitch. You can also measure Acme threads from 3 to 16 threads per inch. The thread measuring wires come with thread charts and are furnished with a quality vinyl case. This is a quality American-made product from Fisher Machine Shop. These are the original Pee Dee thread measuring wires. These pin gages provide one of the best ways of measuring hole diameters. They can also be used to measure the distance between holes and for go/no go gaging.. This set includes 50 pin gages, one for each 0.001" from 0.011" to 0.060". Each of the pin gages are individually marked with their respective sizes. These pin gages provide one of the best ways of measuring hole diameters. They can also be used to measure the distance between holes and for go/no go gaging. This set includes 190 pin gages, one for each 0.001" from 0.061" to 0.250". Each of the pin gages are individually marked with their respective sizes. This plastic case holds a standard 1" dial indicator and magnetic base. It is the same case that comes with our 1782 set. Head is 3.3" x 2"
Protractor made in the US by Products Engineering Corporation (PEC). Protractors are used for drawing radial lines, transferring angles, setting bevels, and setting tapers. This is a highly useful and accurate tool for setting bevels, transferring angles, small squaring tasks, checking cutter clearances within certain limits, and many other applications. Double graduations from 0-180° in opposite directions permit the direct reading of angles and supplementary angles. The back of the tool is flat for ease of use. Semi-circular head is 3.3" x 2"
Protractors are used for drawing radial lines, transferring angles, setting bevels, and setting tapers. Made in the US. The radius gage set is furnished in a vinyl case for storage. Radii or fillets can be checked or laid out easier, faster, and more accurately with Starrett radius gages. Each radius gage set is furnished in an attractive case which provides complete protection and easy, instant selection of the right gage size for the job. Starrett Radius Gage Features: Made of satin finish stainless steel - rust and stain resistant. Each gage is clearly marked with its radius. Each gage has five different gaging surfaces for both convex and concave radii. All gages have precision finished radii with extra smooth, accurate edges. Gage Holder Features: Any gage can be used with the Starrett No. 110 holder which is especially useful for checking radii in confined or hard-to-reach locations. Two slots are provided in the holder permitting gages to be held at 30° or 45°, either square in the slot or tipped to one side. The holder is 4" (100 mm) long, providing good reach and balance. Screw checkers provide a quick way to measure standard threads. They provide all the information you need for screws; diameter, length, threads per inch, hole size and even tap drill sizes. Starrett screw pitch gage with 30 leaves. Measures 60° threads from 4 - 42 threads per inch (TPI). Starrett screw pitch gages are among the most useful tools in any mechanic's toolbox. They quickly determine the pitch of various threads. These thread gage tools consist of a substantial steel case with a number of folding leaves at both ends, each leaf having teeth corresponding to a definite pitch, marked on each leaf. The screw pitch gage features a locking device at both ends of the case, so leaves can be securely locked in position for use. Leaves have a special narrow design, permitting checking internal threads in nuts, etc., as well as external threads. Leave Sizes: 4, 4.5, 5, 5.5, 6, 7, 8, 9, 10, 11, 11.5, 12, 13, 14, 15 threads per inch (TPI) Leave Sizes: 16, 18, 20, 22, 24, 26, 27, 28, 30, 32, 34, 36, 38, 40, 42 threads per inch (TPI) Starrett catalog number 6. Starrett metric screw pitch gage with 28 leaves. Measures 60° threads from 0.25 mm to 2.50 mm. Leave Sizes: .25, .30, .35, .40, .45, .50, .55, .60, .65, .70, .75, .80, .85, .90 millimeters Leave Sizes: 1.00, 1.10, 1.20, 1.25, 1.30, 1.40, 1.50, 1.60, 1.70, 1.75, 1.80, 1.90, 2.00, 2.50 millimeters Starrett screw pitch gages are among the most useful tools in any mechanic's toolbox. They quickly determine the pitch of various threads. These gages consist of a substantial steel case with a number of folding leaves at both ends, each leaf having teeth corresponding to a definite pitch, marked on each leaf. Starrett screw pitch gages are available in a wide range of sizes with different numbers of leaves in various pitch ranges with which to gage. The screw pitch gage features a locking device at both ends of the case, so leaves can be securely locked in position for use. Leaves have a special narrow design, permitting checking internal threads in nuts, etc., as well as external threads. Starrett catalog number 156M. Starrett hand scriber. Starrett catalog number 70A. The 1/4" diameter handle is of steel, knurled, and nickel plated. The scriber point is steel, properly hardened and finely tapered so that the location of the point is not obscured. The scriber is held firmly in the handle by a knurled chuck and when not in use can be reversed, telescoped into the handle, and locked by the chuck. The hexagon head prevents rolling. The scriber point is shipped reversed in the handle so the point is protected. Starrett hand scriber. Starrett catalog number 70B. The 3/8" diameter handle is of steel, knurled, and nickel plated. The scriber point is steel, properly hardened and finely tapered so that the location of the point is not obscured. The scriber is held firmly in the handle by a knurled chuck and when not in use can be reversed, telescoped into the handle, and locked by the chuck. The hexagon head prevents rolling. The scriber point is shipped reversed in the handle so the point is protected. Replacement Scriber for the 12" Dial Height Gage, item 3092 The "shank" is 0.23" wide and 0.32" tall. The overall length is 1.7" and the overall height is 1.3"
Accurately and quickly gages small holes, grooves and slots. Insert the appropriate gage (smaller but closest to bore diameter) into the hole. Rotate the knurled base to expand the end until a slight pressure is felt when the gage is moved in the bore. Remove the gage and measure with a caliper or micrometer. These small hole gages are well balanced tools that are ideal for accurately measuring small holes, slots, grooves, and recesses in all kinds of work. The radius on each gage is less than the minimum diameter to be measured, which provides the two-point contact necessary for maximum accuracy. They have smooth, sensitive adjustment for better feel, giving more accurate measurements. The adjustment of the gage beyond their range is restricted by a safety stop that prevents breakage Accurate measurements are obtained by slightly "rocking" these gages in the hole to be measured. This will guarantee contact at the true diameter. The final size is then obtained by measuring over the ball contacts with a micrometer. Furnished in a vinyl pouch. These high quality toolmaker's squares feature hardened, ground, and lapped stainless steel construction on both the blade and the beam. The beam is machined at the inner corner for clearance. Flexible steel rule made in the US by Products Engineering Corporation (PEC). Starrett 12", 5R graduations, full-flexible steel rule. Graduation No. 5R - quick-reading 10ths, aircraft quick-reading 100ths, 32nds and 64ths. This rule is 1/2" wide and 1/64" thick. All Starrett precision steel rules are photoengraved and tempered for long life and flexibility. They are inspected to Starrett Master Standards, which are traceable to the National Institute of Standards and Technology. Flexible steel rule made in the US by Products Engineering Corporation (PEC). Graduation 31 (inches and metric) with total overall length of 1500mm. See Chris' Tips "How to Use a Steel Rule" for more information on graduations. 150 mm (5 3/4") No. 31 graduations rule. Graduated 150 mm end-to-end on mm edges and to 5-3/4" with a blank end on the inch edges. 1/2" wide and 1/64" thick. Starrett 150 mm (5 3/4") No. 31 graduations, full-flexible steel rule. Starrett catalog number C331-150. Graduated 150 mm end-to-end on mm edges and to 5-3/4" with a blank end on the inch edges. Graduations No. 31 - 32nds and 64ths on one side; mm and 1/2 mm on reverse. All four edges graduated from same end. This rule is 1/2" wide and 1/64" thick. All Starrett steel rules are photoengraved and tempered for long life and flexibility. They are inspected to Starrett Master Standards, which are traceable to the National Institute of Standards and Technology. Rigid steel rule made in the US by Products Engineering Corporation (PEC). See Chris' Tips "How to Use a Steel Rule" for more information on graduations. Starrett 6", 4R graduations, full-flexible steel rule. Starrett catalog number C304R-6. Graduation No. 4R - 8ths, 16ths, quick-reading 32nds and 64ths. This rule is 1/2" wide and 1/64" thick. All Starrett precision steel rules are photoengraved and tempered for long life and flexibility. They are inspected to Starrett Master Standards, which are traceable to the National Institute of Standards and Technology. Starrett 6", 5R graduations, full-flexible steel rule. Starrett catalog number C305R-6. Graduation No. 5R - quick-reading 10ths, aircraft quick-reading 100ths, 32nds and 64ths. This rule is 1/2" wide and 1/64" thick. All Starrett precision steel rules are photoengraved and tempered for long life and flexibility. They are inspected to Starrett Master Standards, which are traceable to the National Institute of Standards and Technology. 3550 Tap and Drill Gage, Starrett "Time Saver"
This highly useful gage shows at a glance the correct size tap drill for any common size machine screw tap in "NF" National Fine or "NC" National Coarse Thread Series, that will leave the right amount of stock for approximately 65% full thread. The gage also shows the correct body size drill to use. In addition, there are 60 holes marked with the number size and decimal equivalent of the drill that fits each hole. Example: a size 2-56 tap (No. 2 tap with 56 pitch) calls for a No. 50 tap drill and a No. 44 body drill. The gage has a black matte finish with information steel stamped on one side and white marked on the reverse side for quick, clear reading. The gage is thoroughly tested for accuracy after hardening. Approximate size, 5/64" thick by 2 5/16" wide by 6 1/4" long. Use telescoping gages to measure ID, deep holes, recesses, slots, grooves, and other hard to reach places. Measure the actual size or lock the self-centering plungers to a known size for a go-no go gage. Range: Four gages, 5/16" to 2-1/8"
Starrett telescoping gages are used for determining the true size of holes, slots, and recesses up to 2-1/8" (54 mm). The ends of both contacts are hardened and ground to a radius to allow proper clearance on the smallest hole the gage will enter. These tools must be slightly "rocked" in the hole being measured to ensure that the tool is on the proper diameter before it is locked and withdrawn. The final hole size is obtained by measuring over the gage contacts with a micrometer. The No. 579 Series telescoping gages have handles that are rigidly attached to the contact plungers and are automatically self-centering. Also, the No. 579 gages have two telescoping contacts. The handles are approximately 2-3/8" (60 mm) long. Constant spring tension gives uniform contact pressure and both plungers are easily locked at any desired setting. 2879 Telescoping Gage Set, 6-Piece 5/16 - 6"
Starrett telescoping gages are used for determining the true size of holes, slots, and recesses up to 6" (152 mm). The ends of both contacts are hardened and ground to a radius to allow proper clearance on the smallest hole the gage will enter. These tools must be slightly "rocked" in the hole being measured to ensure that the tool is on the proper diameter before it is locked and withdrawn. The final hole size is obtained by measuring over the gage contacts with a micrometer. The No. 579 Series telescoping gages have handles that are rigidly attached to the contact plungers and are automatically self-centering. Also, the No. 579 gages have two telescoping contacts. The handles are approximately 2-3/8" (60 mm) long. Constant spring tension gives uniform contact pressure and both plungers are easily locked at any desired setting. Clamping diameter range of 1-3/8" to 2"
Length from the center of the clamp to the indicator can be up to 6-1/2"
This test indicator holder has a clamping diameter of 1-3/8". The length from the center of the clamp to the indicator can be up to 6-1/2". The test indicator clamps to the outside of an end mill holder and does not disturb the working tool. reaches anywhere within a 8" diameter and fine-adjusts approximately 3/8"
Setting up a workpiece before machining, aligning the center of a round workpiece in relation to the cutting head, or aligning vise jaws to the spindle takes virtually no time this test indicator holder. 26 Tapered Leaves, 1/2 - 1/4 x 3-1/32"
Locking device. Leaves easily removed or replaced. Starrett thickness gage set (feeler gage) Starrett catalog number 66T. 26 Tapered Leaves, 1/2 - 1/4 x 3-1/32" Range .0025-.025" Leaf Thickness (Inches): .0015, .002, .0025, .003, .004, .005, .006, .007, .008, .009, .010, .012, .013, .014, .015, .016, .017, .018, .019, .020, .021, .022, .023, .024, .025 The gages of this Starrett feeler gage set are used in automotive, aviation, diesel, and farm equipment manufacture and service, and also in jig, fixture, gage, and experimental work. Especially useful in adjusting tappets, spark plugs, distributor points, checking bearing clearances and gear play, fitting pistons, rings and pins, and gaging narrow slots. Leaves made of finest tempered-steel, carefully finished to correct thickness, individually tested and marked with thickness. Locking device on most gages - permits securely locking one or more leaves in position. Leaves are easily removed or replaced. Gage has a rugged, substantial steel case protects leaves. This wiggler center finder set comes with 4 probes for finding centers, edges, and indicating. Each probe snaps into the body without removing the collet nut. The wiggler shank is 0.375" diameter.